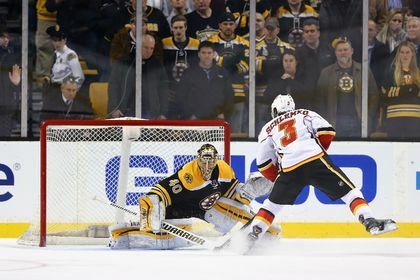 The famous shootout goal will forever be David Schlemko’s calling card so long as he’s part of the Calgary Flames. Considering that Schlemko is yet to suit up for the Flames at the Saddledome, having joined the team during their recent road trip, his highlight-reel skills-contest tally last week against the Boston Bruins created a reputation that precedes him. Schlemko’s goal — a jaw-dropper with how he beat Tuukka Rask for the winning tally with a move reminiscent of Peter Forsberg’s Olympic gold-medal winner from 1994 — created a buzz in the Stampede City that’s blown away the defenceman who was scooped up from the Dallas Stars on the eve of the trade deadline. “I never thought a shootout goal would blow up that much, but it’s been pretty cool,” said Schlemko, who enjoyed a day off Monday before the team gears up to resume action Wednesday against the Anaheim Ducks. “I got a lot of texts and stuff on social media. In turn, the Flames faithful are excited to welcome the depth defenceman, in big part because of his high-skill marker. Had he not scored that goal, Schlemko would be a rather anonymous arrival to the Flames, even though they didn’t make any trades which brought in other faces prior to the deadline. Instead, he became inundated with messages from all kinds of friends and even found out about the fake postage stamp created of his goal and Twitter hashtag #TheSchlemko. “I’ve played for quite a while in a non-hockey market, so it’s pretty neat to see how something like that can happen,” said the Edmonton product. Days later, people in the organization still love to talk about his goal. Craig Conroy, one of the team’s assistant GMs, was in a restaurant in upstate New York watching the game on TV. He knew Schlemko had scored on his lone previous NHL shootout attempt while with the Arizona Coyotes, but figured it was thanks to a pin-point shot. “I didn’t see that coming. When he turned backwards, I thought, ‘What’s he doing?’ but then it was, ‘Oh, wow.’ I almost choked,” Conroy said. “That was pretty exciting. I never expected it. Schlemko wasn’t able to duplicate his feat in Sunday’s shootout against the Ottawa Senators — hitting the post with a chance to pot the winner in what eventually became a 5-4 loss — but his goal in Boston solidified a spot for him among his new teammates, something that can’t be overlooked. Arriving in Calgary also gives Schlemko a chance to finally settle down amidst what’s been a testing season. He started the year with the Coyotes, was claimed off waivers by the Stars in early January but only played five games for them before they put him on waivers and the Flames grabbed him. Getting to Calgary gives him a chance to get his feet on the ground and catch up with his family. His wife and daughter are planning to live in their off-season home outside of Edmonton, but his dog will remain with friends in Dallas for now. “It’s been a trying year,” he said. “Right now, I’m excited to be here.